Sorry for all the transmog posts lately….I blame JD 🙂 Yes yes!! Of course my only issue is a mace now..all the ones I like are from heroic ICC or FL…so I have to lower my preferences 🙂 heheh But i am calling him the purple nurple!!! Onto other things, I took my Druid into LFR to heal…and I sucked…I really just don’t get druid healing…although I have only done it a couple of times so perhaps I am being too harsh on myself. I may just give up on the healing. My rogue is now level 20 and has riding skills 🙂 This makes me happy as running around it just killing my will to live. I am not sure how far she will go, but anything is possible. Hubby got his druid to 84 this morning, and we are currently on our pally/shammy combo trying to get them to 85 as they are fully rested now. Funny tangent, we had them in a guild which no one ever spoke in – over 400 members and I think I had seen people speak in guild chat once…when I joined about 6 months ago. So we left that guild today because we just got sick of the silence even when trying to get a conversation started. About 1.5 minutes after leaving the guild, we get a guild invite to the same guild!!! A generic whisper saying our guild is looking for members, join us type thing, so we both messaged back something much less polite than “we just left your crap guild”. I did giggle. 1 – I may be able to convince him to raid if the team is not as unco as he currently experiences. 2 – I have not mentioned raiding at all except that they progressed well and seem to be quite competant. I felt a little twinge of excitement when he said that because it gave me some hope. 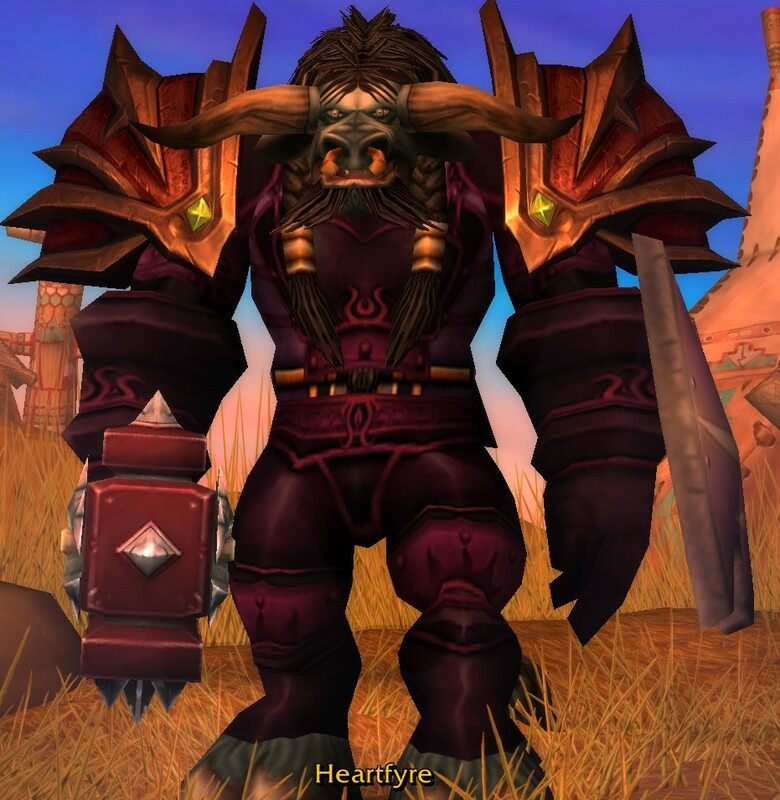 I may be able to raid with him horde side again…somewhere!! I had a happy! My mage is feeling very unloved at the moment, and I do feel bad for her. I might try and do an olympic transmog for her now and see if I can’t give her some loving. That set looks good on Heartfyre.